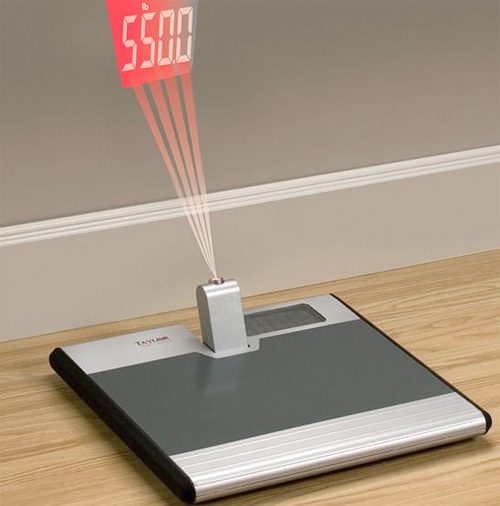 Projection Scale Also Has A 550lb Capacity | OhGizmo! When I first saw a photo of this scale with a built-in projector I was going to joke that it was the perfect bathroom accessory for the morbidly obese who weren’t able to see the readout on a conventional scale. But with the ability to weigh someone up to 550lbs, it turns out that’s exactly what it’s designed for! In addition to the adjustable projected display the scale also has a large easy-to-read LCD display on the base for those not battling with extreme health issues, and it’s powered by just 3xAAA batteries. Most surprising though is that it’s available from Amazon for just $79.99, since a scale like this would normally cost considerably more when purchased through a medical supply store. Kinda sad they are making scales that can weigh that high.. Just another excuse knocked off the list of why to loose weight. That's actually a very reasonable price, and all jokes aside thats also very practical. Hell, i'm not even obese and I want it just because it shoots lasers!